On 15.11.2018 the closing event of the “Sino-German Capacity Building Programme for Young Professionals of the Agricultural Sector in 2018” took place at the EuroTier 2018. On this occation, the Young Professionals received their Certificates in attendance of Dr. Ulrich Kleinwechter from the Federal Ministry of Food and Agriculture (BMEL), Ms. Wu from the Ministry of Agriculture and Rural Affairs of People’s Republic of China (MARA) as well as Mr. Luo, Ms. Yu and Ms. Xi from the Center for International Cooperation Service (CICOS). Also, representatives of the companies who hosted the trainees during their stay in Germany attended the ceremony. These hosting companies are: Besamungsverein Neustadt a.d. Aisch, German Farm Consulting GmbH & Co.KG, Caisley International GmbH, Menno Chemie Vertrieb GmbH, Klindworth Klauenpflege Schule, Aratowerk GmbH & Co. KG, Sano – Moderne Tierernährung GmbH, Röhren- und Pumpenwerk BAUER Gesellschaft and Big Dutchman. All 22 Trainees came together to receive their certificates, which have been signed by the two Ministers, Mr. Han Changfu and Ms. Julia Klöckner. 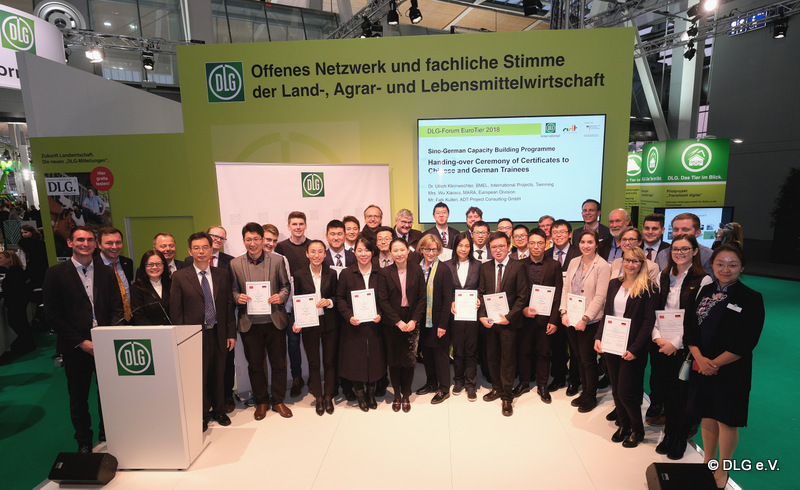 The certificates have been ceremonially handed over by Dr. Kleinwechter (BMEL) and Mr. Luo (CICOS) during an official ceremony which took place on the DLG stage at EuroTier. The event was the last highlight of an exciting Trainee Programme implemented by ADT Project Consulting GmbH which stimulated the professional exchange between Germany and China and strengthened the German-Chinese network of young professionals from the livestock sectors of the two countries.